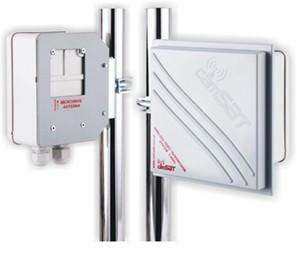 Integral Directional Antenna supplied in kit. Range up to 3km External line of sight. Pole Clamps 30mm~50mm included in kit with Wall Mount accessory available. 8 selectable operating Channels for multi camera use. DC12V 2 Amp power supplies included. 5.8GHz Transmitter + Receiver with integrated directional antenna, 3 km Range when used externally, outdoor IP66 housing, wall-mounted or 30-50 mm rod-mounted, 1 BNC video input, 2 audio inputs, 8 operating channels selectable with switches, large size cable bushing for 11 mm cables, Power Supplies included.